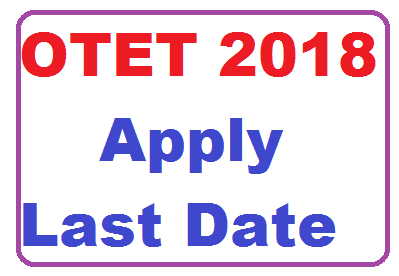 OTET 2018 apply last Date- Latest information is OTET online apply last date extended. Latest Update and Good news for all applicants who are not applied for OTET 2018 or not fill OTET Application form 2018 till now. For more details please go through this post below. Here is good news for all who are not able to apply OTET exam 2018 that one more chance to apply who are not fill OTET 2018 online application till now. The latest update is the Last date for OTET Application has been extended to 10.12.2018. According to First OTET Notification OTET online apply last date is 28.11.2018 and applicants can pay fees online or offline by 27.11.2018 midnight and can submit it by 28.11.2018. But now applicants can fill online application by 10, December 2018. Now OTET online apply last date is 10.12.2018 instead of 27.11.2018 according to the latest information. So, applicants who are not able to apply OTET Application Form 2018 due to some unavoidable circumstances, they have a chance to fill OTET application. The payment for OTET fee shall be done through SBI Collect either online mode or offline mode latest by 11:45 pm of 10/12/2018. However, filling up of OTET 2018 application forms through online can be carried out till 11/12/2018 midnight. OTET online apply last date is extended because of allowing in-service untrained teachers pursing D.El.Ed training through NIOS to apply for OTET exam 2018. Note- The official notification not released yet on BSE Odisha portal. If a notification regarding OTET 2018 apply date extended I will provide the same link below in this post. The applicants who try to OTET 2018 apply online for the OTET 2018 need to fill OTET Application Form 2018 through online on the official website BSE Odisha www.bseodisha.ac.in. You can also get OTET Application form direct link below in this post. The applicants who need to apply for Class I to V i.e paper I probably passed +2 (Plus Two) standard from recognized Board of Odisha or equivalent, must have a Diploma in Elementary Education. Candidate should be secured at least 50% marks for general category and reservation category will be given 5% relaxation. The applicants who need to apply for Class VI to VIII i.e paper II must be passed Graduation from recognized University and must be cleared B.Ed or must have Diploma in Elementary Education in which Candidate should be secured at least 50% marks for general category and reservation category will be given 5% relaxation. For OTET 2018-19 application fee candidate can pay the application charge by online mode or offline mode. 1. OTET 2018 online application form will be available from 12th November 2018. 2. Applicants should visit the official site for an application form. 3. OTET 2018 Application Form must fill all details correctly online mode. 4. After filling the form press submit button. 5. Then applicants can pay application fees by means of online or offline mode. 6. At last, take a printout of confirmation copy and keep a printed copy for future reference. The OTET Admit card 2018 will available by OTET authority before 10 days f OTET 2018 Examination. Applicants can download OTET Admit card 2018 by visiting the official site by entering Registration No, date of birth and so forth. The OTET Result 2018 will be accessible on the official site. Applicants can see their result and can download a duplicate of result from the official site. Finally, you can know theOTET online apply last date and You can download your OTET 2018 Syllabus from official website bseodisha.nic.in and prepare for OTET 2018 Exam. I think you like this post very much and helpful to you. Please keep regular visit for more OTET 2018 updates and share this post to your friends and relatives.